The Harvest Your Own Pearl Necklace is a fun and creative way to gift jewelry. Inside each authentic oyster shell is a cultured pearl. Open the can, pry open the oyster shell, remove the pearl and place it into the hinged silver-plated treasure locket with neck chain. • Recommended for ages 13+. A fun and creative way to give the gift of jewelry. 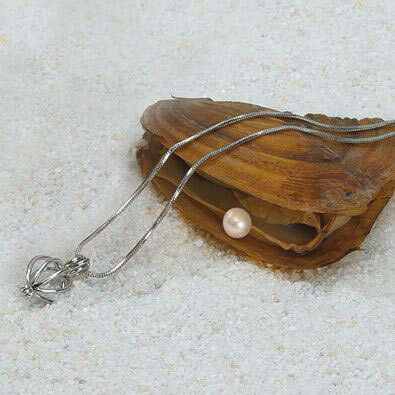 Inside the authentic oyster shell is a cultured pearl. Open the can, pry open the shell with the included opener, remove the pearl and place it into the hinged silver-plated treasure locket with bracelet chain. The pearl will be one of five colors shown on the description chart. A great gift for a young lady. Oyster is contained in a 25% disinfecting solution. Adult supervision recommended. This item cannot be shipped to a P.O. box. Ages 13+.